Can You Massage Cucumber Juice on Your Scalp for Thinning Hair? LaMont Jones was an award-winning fashion and beauty editor for a decade at the "Pittsburgh Post-Gazette." A five-time nominator and judge of the CFDA Awards, he covers New York Fashion Week regularly. Jones is a 2011 inductee into the Pittsburgh Fashion Hall of Fame and coaches fashion models. Fruits and veggies are great additions to your haircare regimen because they promote healthy locks naturally. One of the best foods for preventing hair loss and addressing thinning hair is the cucumber. Combine this nutrient-rich food with other ingredients and a massage to reap even more benefits. Cucumbers contain lots of vitamins A and C and silica, which promotes hair growth. 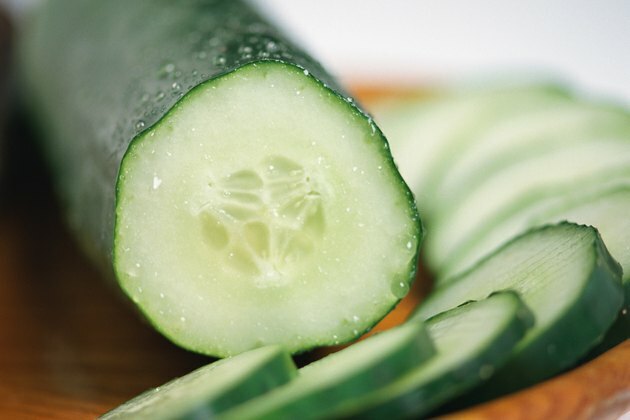 Cucumber repairs and strengthens damaged and thinning tresses, especially when combined with aloe or egg. Cucumber is soothing because of its alkaline minerals, such as sodium, potassium and magnesium; and its juice offers benefits when applied directly to the scalp and hair. Cucumber can also address skin maladies that impede hair growth, such as psoriasis and eczema. Massage the scalp with oil extracted from cucumber seeds through the process of cold-pressing, which preserves the nutritious properties. Some hair thinning and loss can be due to dryness of the scalp, and the oil contains hydrating and restorative nutrients, such as tacopherols and phytosterols. After washing your hair with cucumber shampoo and cold water, blot it to remove excess moisture. Apply a drop of cucumber oil to each finger on one hand and then gently place the fingers on the other hand on the oiled fingers. Bend over and massage your scalp with both hands until your head is tingly and warm. It may even turn a little red, which is fine. Be sure to massage areas that are bald or where hair is thin. The rubbing enhances circulation and stimulates sebaceous glands, both of which can aid hair growth. For added benefits, shampoo and condition with a product infused with cucumber. You can buy a commercial version or make your own. A simple DIY recipe for a cucumber “shampoothie” -- a shampoo and conditioning hair smoothie combined -- includes a peeled cucumber, a peeled lemon and the option of a little olive oil or rosemary oil. Just mash the cucumber, grind the lemon and mix its juice with the cucumber, and add 1/4 teaspoon of oil, if desired. Massage the paste into your hair and scalp, leave in for 15 to 30 minutes and rinse with cold water. You can perform the cucumber oil massage immediately after. Are There Benefits of Carrot Oil for the Hair? What Are the Benefits of Mustard Oil for Hair Growth?